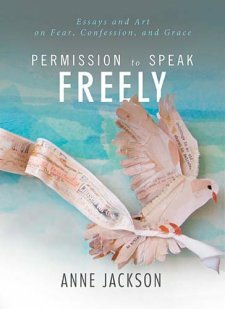 i’m thrilled to be a part of the book blog review today for anne jackson’s new book permission to speak freely. in may 2008, anne jackson asked a question on her blog,“what is one thing you feel you can’t say in church?” hundreds responded. everyone had a story. permission to speak freely is the artistic collaboration and movement of author anne jackson, who is through with keeping brokenness in the dark. bringing to light the original intent of god’s sanctuary as a place of help and healing, anne reveals that through confession, both to god and to others, we can live lives that are whole and healed. told with disarming transparency, anne shares what led to her own addictions and the ensuing lifestyle that left her wounded and withdrawn. 1. i really enjoyed this book. it’s creative. honest. personal. a breath of fresh air. 2. i recommend this book. buy it for yourself and a friend. and talk about it with each other. 3. tomorrow’s blog includes a few of my own personal reflections after reading the book. sanctuary: i absolutely devoured this essay as anne described the way church was intended to be: a refuge, and a safe place for everybody especially those who are the most broken. anne writes a condensed version of church history beginning with the christian church adopting the right of sanctuary in the fourth century, through the time of slaves, village townsmen, women, and children taking refuge in the church, and up until current church culture in which most people must choose church not as sanctuary but as a place either for conforming or escaping. the word sanctuary connected with my spirit, and reminded me that i want to be a catalyst in reclaiming church as a place for healing, confession, and redemption. the gift of going second: the whole book is fantastic, but totally worth the cost if only for this chapter. anne describes the gift of going second as “an experience whenever somebody confesses something, and they’re the first to do it. it’s usually a pretty hard step to take. they don’t know how people will respond. they fear all the judgement and isolation. but they do it anyway. they give a gift.” i love this! usually when i’m with a friend who i know is struggling, i’ll ask questions – “how are you?” “what’s going on with..?” i’ve always thought this was loving, and thoughtful, but after reading this essay, i’m wondering if i put the other person in a tough spot when i ask questions without sharing my own confession first. when we allow others to go second, we level the playing field and share in both the brokenness and the healing. fantastic. tomorrow, a few reflections on how the book affected me. for today, if you dare be so bold-add your own confession on thewebsite. disclosure: thomas nelson publishing sent me a free book in exchange for a blog review.